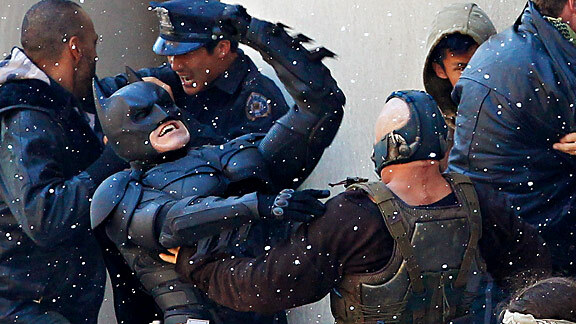 Is there anything stupider-looking than set photos from a superhero movie? Not really! But here are some pictures from this weekend’s The Dark Knight Rises shoot in Pittsburgh anyway. The challenge for Christopher Nolan’s trilogy-finisher will be finding a way to shoehorn silly villains like Bane (Tom Hardy) and Catwoman (Anne Hathaway) into a Gotham City grittier and more realistic than the campy, art-directed ones that hosted Tim Burton and Joel Schumacher’s Batmans. It could be all the un-Nolan-esque daylight and smiling crew members in these shots, but Hardy’s Bane doesn’t look nearly as terrifying as Heath Ledger’s Joker did, or even much scarier than the Bane from Schumacher’s Batman and Robin. Blame it on the cargo pants. Or the laser tag vest. 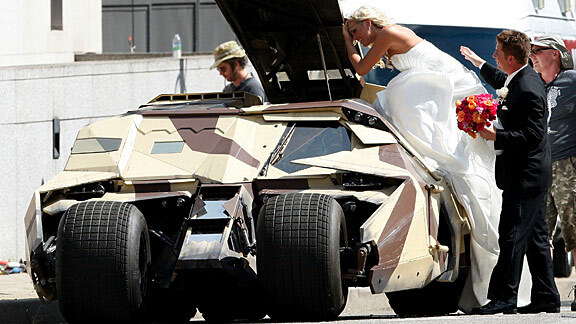 Or maybe the wedding happening down the block in the Batmobile. Click through for more photos.